Last month, T-Mobile (NASDAQ:TMUS) and Sprint (NYSE:S) entered into a definitive agreement for a merger, after multiple failed attempts. If the deal goes through, it could effectively reshape the U.S. wireless landscape. While the deal would increase industry concentration, reducing the number of nationwide wireless carriers from four to three, it would also create a larger and potentially stronger contender to market leaders Verizon and AT&T. In this note, we take a brief look at what the deal could mean for Verizon and AT&T. If T-Mobile and Sprint are able to close their merger, the combined entity would have a deep portfolio of spectrum, including T-Mobile’s recently acquired 600 MHz licenses and Sprint’s 2.5 GHz resources for 5G deployment. Using the combination of lower and higher band spectrum, the joint entity could provide subscribers with faster and more reliable connections, giving them less incentive to switch carriers. By jointly building out their 5G networks, the company could also build out a denser network, while avoiding the duplication of a significant amount of capital expenditures. There could be branding benefits as well. T-Mobile has built significant brand value over the last few years, in contrast with the Sprint brand, which has been viewed in a relatively mixed light by consumers. As the combined entity would adopt T-Mobile branding, with Sprint’s retail footprint also being rebranded to T-Mobile stores, it could help in better taking on the larger two players. Sprint’s CEO has indicated that the merger would effectively lower costs for subscribers; the companies estimate upwards of $6 billion in cost synergies, which could allow the combined carriers to offer cheaper service. 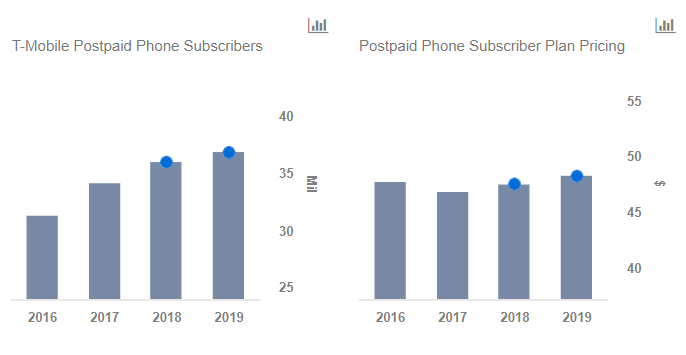 The two carriers typically have the most price-conscious postpaid subscribers, and it’s possible that they could continue to play the pricing card to retain and grow their base. That said, the increasing market concentration with just three major players is unlikely to incentivize carriers to continue to compete as strongly. Moreover, T-Mobile and Sprint, in particular, have been fierce competitors, bringing down prices and offering a lot of value-add for customers, forcing the larger two players to follow suit. For instance, the two carriers were the first to reintroduce unlimited plans while offering value-added offerings such as bundled Netflix and Hulu connections. With the absence of this competition, it’s possible that wireless companies will be less aggressive with promotions.